Small sunspecks emerging on both solar hemispheres | Watts Up With That? For those that don’t know. The SOHO spacecraft sensor does have some stuck pixels, and these can sometimes be cured in a “bake off” where they heat up the sensor for a few hours. Our resident official solar physicist, Dr. Leif Svalgarrd will confirm or refute my suspicions on the categorizations of SC23 and SC24 I’m sure. For comparisons, you can also see the SOHO magnetogram. UPDATE: The specks are fading, so far no observation agency has assigned a region or counted them that I know of, see the updated SOHO MDI. ← Will September be the month the sun truly transitions to Cycle 24? Those are the most pathetic sunspecks I’ve seen! I often check the magnetic image to see where the sunspecks are (it’s easier than remembering the stuck pixels), but even that is lame. Perhaps they’ll grow into some worth counting, but they need some help soon. IF either of these specklets grows into a spot, AND it’s a Cycle 24 spot, then (assuming it gets a NOAA number) September 2008 will be the first month in which Cycle 24 has managed to produce more than a single Active Region. Aren’t those sunspecks for the same cycle’s polarity since they’re on different hemishpere’s? These are updated much more frequently than the SOHO images. That magnetic disturbance in the southern hemisphere looks like it’s more leaning toward SC24 since it seems the white is leading – sorta. But whatever, those are really anemic spots showing, though they seem more notable than this morning. Perhaps in a few more hours we’ll see if there’s something we can hang our hats on. I still think that other measures are more important. Like the conveyor belt speed. The magnetic properties of the Sun that affect Earth. CME’s from sunspots. Etc… Is it possible that cycle 24 will burble along at this anemic state, even producing lots of tiny tims and still be no more active than a blank Sun in terms of these other measures? I think so. And that would be very interesting. Moral of story, always wait for the expert (Lief) to weigh in before you get excited. Wow, my bad. Now I see that SP means Stuck Pixel. hahaha. Us old guys are to analog. At least we can still learn. @Gary SP stands for “Stuck Pixel”, not sun speck. Heh. I am not quite fast enough with my comments. It’s extremely unlikely those are dust spots on the optics, such critters merely block a little light and introduce a little loss of contrast. Unless the f-stop is extremely high, there’s essentially no way you’d be able to see them and less of an opportunity for them to occupy one pixel. Dust on the image sensor would be more likely, but given that a bake cycle can restore functioning for a while, they are just stuck pixels. OT: speaking of space telescopes, Hubble’s image processing unit has failed, delaying the shuttle repair mission while folks figure out what to do about it. There is another way of looking at solar cycles. 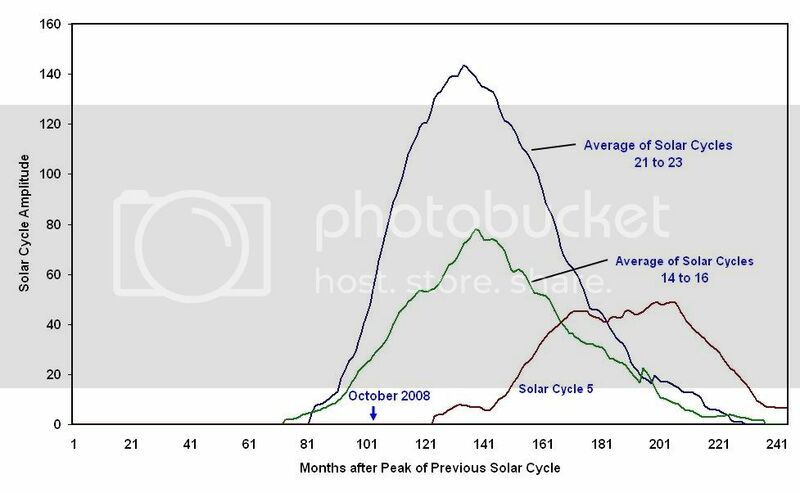 Solar cycles actually start with the magnetic reversal near the peak of the previous cycle. The sunspots take seven years to surface and be visible. Almost all sunspot cycles tend to be about 18.5 years long, measured from the peak of the previous cycle. The above graph compares the average of three cycles from the late 20th century with three from the late 19th century (which had much colder weather). Also included is Solar Cycle 5, the first half of the Dalton Minimum. Given we are now 103 months from the peak of Solar Cycle 23, it now appears too late to get a late 19th century-type outcome for Solar Cycle 24. Out of the 24 named solar cycles, Solar Cycle 24 is now the latest after Solar Cycle 5. It is so late that it is now in no man’s land and its weakness is now more of a consideration than lateness in itself. It is now almost certain that we will be getting a Dalton Minimum-type experience. “Is it possible that cycle 24 will burble along at this anemic state, even producing lots of tiny tims and still be no more active than a blank Sun in terms of these other measures? I posed this same scenario to Leif in the last blog, but did not get a reply. I agree that this will be a lackluster cycle for the same reasons you site. This is shaping up similarly for now to cycle 6: slow, weak ascent to a low high and back again. The flux fell back down again today, just a blip for mid-September, and it’s back to anemic. Ergo I fully expect that these sunspecks are going to fade just as fast as 9/11’s even if they make visibility. The flux is like fuel in the gas tank, and currently it’s running on fumes. Nothing behind these spots. Tiny bubbles. There’s no fizz in the bubbly. The speck in the North is clearly SC24. The one in the South is more doubtful. My inclination would be SC23 based on its latitude, However, the magnetic axis is nearly North-South so the polarity is uncertain, but with a weak tendency to SC24 signature. So perhaps a toss up. I guess we’ll see in a few hours if SIDC [Catania] report the spots. NOAA didn’t for 29th Sept.
You can’t be serious with this. Did they really assign numbers to these?!? Geez…now we’re getting down to atom ant sunspots. Any word from Dr Livingston on magnetic flux value for the most recent spot?? I’ve just had a look at the latest SOHO image. I don’t see anything. -leads to observations of the suns magnetic field from the earth but also lets you know if it’s cloudy at the measuring site-I can invent a plausible reason but…? From that page one fonds the link to “Farside Images”, which made me smile! 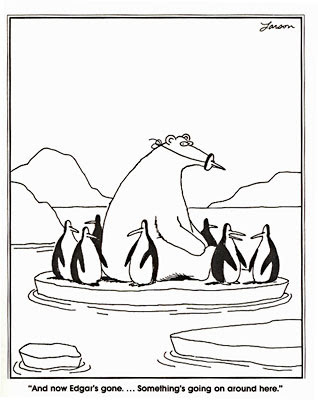 Yes, I know, polar bears dont live with penguin but that won’t stop Big Al blaming the cartoon on global warming and does get North and South hemispheres into the picture! i would love to see Leif’s prediction for SC25 and what drives it….speculating around the edges seems futile to me. No, not even the Catania observatory. So far they’re not even in the same league as the August specks. would also love to see what David Archibald’s thoughts on the same topic?….the main question being the reason behind the prediction. Unfortunately this continues the trend of support to the Livingston & Penn idea of diminishing contrast between the sun and its spots. For those unfamiliar with the idea, Livingston & Penn project that if the trend continues, sunspots will vanish by 2015. While the prediction of SC24 is based on physics [dynamo theory] and observations [Sun’s weak polar fields], the decay of a cycle [which creates the polar fields seeding the next cycle] is random enough to be unpredictable and since observations of said fields are 7-8 years in the future, we really cannot predict SC25. Statistically, small [and large] cycles are grouped together so one can make a good guess that SC25 will be small if SC24 is. And, no matter what the value is, remember that there is a natural spread of values, so one should not attach too much significance to a single data point. 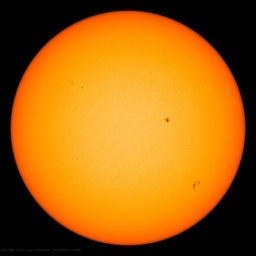 Looks like the sun’s freckles have faded without being assigned a number. There’s more action in the Arctic as ice forms. We don’t have an updated SOHO continuum image from the last 8 hours or so, and with the available ground-based images, I’m not able to make out any specklets at all. In fact, I’m now wondering what minimum criteria an area has to meet in order to be called a plage. If it was never considered an “Active Region,” can it still be a plage? Most interesting is their prediction for SC24: peak sunspot number 42, “+/- 34,” which means if SC24 came in at the extreme low end of their forecast, the peak SSN would be 8 ! These ‘definitions’ are always a bit fluid because there are no sharp boundaries between ‘categories’. A more physical approach is that areas with high magnetic flux [greater than 1500 Gauss] appear dark while areas with smaller magnetic flux appear bright, the brightness fading as the flux fades. ebb of Planetary A index and Solar Wind Velocity. Heck, they never made it to visibility as far as I know of. Their paper is cyclomania and assumes that solar activity is governed by several simultaneous strict cycles. There is no physical basis for such an assumption. Dikpati et al. never claimed that [they did promise several years ago to use their model to predict SC25. A prediction run of the model takes 20 minutes… They never delivered on that promise. Hathaway’s prediction is predicated on their model being correct, i.e. that their prediction for 24 comes out true. You can’t have a wrong prediction for SC24 and then make a credible claim for SC25 based on that same model. SC25 will likely be small too if SC24 turns out small, just on the historical record showing that small cycles often come in groups [a counterexample is SC20]. When you look at the gpeg of the magnetogram (and this is the weird part) both micro-sunspot groups appeared at the exact same time. But there is another pair about in the middle of the northern hemisphere that also appeared at the exact same time too!!! How could three sunspot pairs of different cycles appear at the exact same time? Looking at the latest SOHO image (0839, 30 Sep 08) I can’t even find those specks. Maybe someone else has better eyesight then I do. The latest magnetogram is 7 hours older, and you can still see these specks. The magnetic field strength was 2226 Gauss. Still on track [within the expected spread]. The magnetic field strength was 2226 Gauss. Still on track [within the expected spread]. The contrast was 0.864 also on track [with smaller spread even]. I squinted til my eyes bled and couldn’t see a speck. Which means when Clilverd is proven correct, well outside any prediction of those impanelled, it doesn’t count. All right, we had no clue, but they weren’t allowed to buy one! I would say there is now NO possibility of this winter NOT being blamed on the sun. It will become as hard to tune out the “Solar Winter” noise to focus on the facts, as it is now to tune out the “AGW” noise. I’ve said before that “AGW” will be mocked and ridiculed as never before this winter, and that is now certain. The desperation and spin of the die hard True Believers will be something to behold. You can’t go wrong there. The spin of the die hard True Believers in SGC [Solar Global Cooling] will be something to behold. Both AGW and SGC are equally unfounded and yet both camps claim success: Any failure of SGC [as in 1980-2005] is taken as proof of AGW, and any failure of AGW [as since 2000] is taken as proof of SGC. The spin of the die hard True Believers in SGC [Solar Global Cooling] will be something to behold. Both AGW and SGC are equally unfounded and yet both camps claim success: Any failure of SGC [as in 1980-2005] is taken as proof of AGW, and any failure of AGW [as since 2000] is taken as proof of SGC. The “AGW” crowd has been arrogant and hysterical beyond belief – JUST THIS MORNING demanding food rationing, not because of shortages, but to change the climate. (This is one example of “AGW” economics – ration your surplus, tax and regulate your shortages). Can anyone imagine an SGC Religion, complete with an Inquisition? WE CAN’T FIX THE SUN, we can’t even pretend to. If it’s cold because of the sun, WE HAVE TO LEARN TO DEAL WITH IT. According to the Aztec creation myth, the Sun god demanded human sacrifice as tribute and without it would refuse to move through the sky. It is said that 20,000 people were sacrificed each year. Don’t worry Leif, the ‘overlap’ is conceivable only because Clilverd has such a large sigma. You’ll be out 3, null hypothesis territory. Turn on your Lava lamp, look at cycle 5 (unrevised) and groove to the music of the spheres. All right, I’ll grant you that. I can imagine SOME people saying that, if not as a way to get the sun moving, but as a way of taking care of unfinished business, we need some human sacrifice, starting with Gore and Hansen, and going down the list. The list includes both presidential candidates, but human sacrifice is usually not without some chaos. Don’t worry Leif, the ‘overlap’ is conceivable only because Clilverd has such a large sigma. A worthless error estimate more specifically. Whence the chicken or the egg? The important issue is the accepted Rmax is under 50. While most of us can accept in principle the investigator responsible for the observation revising the data having discovered a systematic error, we are not likely ever to accept ad hoc revision at such a distance by a Gang of Several. No, not at all. The error estimate is better than the prediction. It is not the case that 42 is right and +/-34 is wrong. The important issue is the accepted Rmax is under 50. Rmax should probably be 54, still small. we are not likely ever to accept ad hoc revision at such a distance by a Gang of Several. There is no basis for accusing anybody of an revision. This is a very serious breach of decent etiquette. Shame on you! There is no basis for accusing anybody of ad hoc revision. This is a very serious breach of decent etiquette. Shame on you! I have several times urged you to follow the normal procedure for criticizing scientific work: read the evidence papers, comment specifically on each point that you feel is not correct, and give valid arguments for such assessment. Anything less than that is without merit. One small, sticky [t]issue flopping about behind: AGW is a stinking carcass exhumed for study. SGC is about to be tested over the next half-decade. The Delphic oracle says it is stillborn; that the global temperature trend will decline by 2.0. Make room for the contestants and have a care for your safety. Something went wrong with my less than and greater than signs. Should be less than 0.2 versus greater than 2.0 degrees. The spin of the die hard True Believers in SGC [Solar Global Cooling] will be something to behold. Offset, of course, by the counter-spin of the die-hard True Believers in Anything-But Solar Global Cooling (ABSGC), like Leif, whose disbelief that the sun can drive climate in any way is a profound and tenaciously held one. SGC as far as I know has no political backing, no lobby, no agenda to speak of, except maybe a general desire that the arrogance and many misdeeds of AGW receive some kind of comeuppance. When you talk to people about SGC, most shudder at the possibilities. They’re not secretly wishing for it to really happen (except again, in a sort of perverse desire for AGW revenge). “Pray for sunspots” is an idea you’ve seen here, and one which I’ve expressed myself. I just look at my own daily experience and think about what holds it up. Without a continued favorable climate, I think I’m in big trouble, and if I am, so are hundreds of millions more. Even the Aztecs would consider a climate crash an unacceptable method of human sacrifice. Yeah, except sacrifices work better with virgins. SGC is about to be tested over the next half-decade. that the global temperature trend will decline by 2.0. Hard to see how that could make these difference. Anyway, the die-hards like Archibald would think that 2.0 is even too small. Just try to stick to facts or opinions about facts without embellishments, comments on people’s logic [or lack thereof], intentions, behavior, and the like. Leif, whose disbelief that the sun can drive climate in any way is a profound and tenaciously held one. You got that one a bit wrong. What I’m saying is that the Sun is not the primary/dominant driver. Certainly there are some small effect as there is some small effect of CO2, all of the order of, perhaps 0.1K. Hardly measurable and certainly not significant. If the effects were large [‘overwhelming’ some say] we would not have these discussions. What I’m saying is that the Sun is not the primary/dominant driver. Certainly there are some small effect as there is some small effect of CO2, all of the order of, perhaps 0.1K. Hardly measurable and certainly not significant. You’re entitled to your Beliefs, Leif, odd though they may be. yes, but please don’t misrepresent them. Fine, but what are they? First you say the Sun is not the primary/dominant driver., then you say there are some small effect as there is some small effect of CO2, all of the order of, perhaps 0.1K. Hardly measurable and certainly not significant. You could drive a tractor trailer between those two statements, an indication perhaps of your own cognitive dissonance. All I’m saying is that I will not argue against claims that solar and CO2 might have some minor effects not exceeding 0.1K because effect that are that small cannot be said to be primary drivers of variations that are ten times larger. Where is the dissonance? Understood, see Dave Archibald for SGC orthodoxy. Remove the log from your own eye, Sir. It’s what we do with facts that exercises those frequenting Anthony’s corner. Should have read ‘less than 0.2 degrees’. I’m html challenged. I’m not sure what about Leif’s comments you object to. He’s been very consistent on both solar and CO2 issues. If I’ve been following correctly, the main solar and CO2 issue is that none of the values being monitored consistently, and over long periods of time, correlates with observed changes in Earth temperature. While some correlation can be obtained over selected short periods (eg AGW in recent times), no factor holds up over several hundred years. So, the available data is not 100% consistent with any theory brought forward so far. Based on the total data set, historic changes in solar output do not appear to consistently and reliably predict / influence global temperatures. Same with CO2. Both seem to have a small, and therefore difficult to quantify, effect. Seems like a very reasonable statement and a difficult position to argue with. That said, I really have a difficult time ruling out some, as yet unidentified, solar effect that would actually expain Earth’s temperature history. Most of your posts are ad-hom attacks [to wit what you just said] that have nothing to do with facts or opinions about facts. It would be a welcome change to see a contribution with some [any…] significance or information content. Most of us are trying to maintain a reasonably high signal to noise ratio, please make an effort to contribute. …like Leif, whose disbelief that the sun can drive climate in any way is a profound and tenaciously held one. I’m just a lurker but I’m coming out of hiding on comments like this. Leif serves an important job on this blog — house skeptic. We need a skeptic to keep this blog from becoming an AGW-as-a-religion site. We have to look at the facts and seek the truth, even if that truth sometimes doesn’t agree with our beliefs. A skeptic helps us to do that. Leif is smart and he knows his stuff. He studies the data but comes to a different conclusion than most of us. That’s fine. Leif’s conclusions should provoke respectful and intelligent debates, not name-calling or condescending remarks. How many of us have been unfairly relegated to joke status on sites that believe in global warming? Let’s not sink to their level. Northern hemisphere (former) speck (the one presumed to be Cycle 24) seems to have lost its magnetic identity. I only see a negative or south polarity in the latest magnetogram. I have to support Leif as well. He may correct me, but from what I have read, it seems that he is making the point that there is not enough variability in the output of the sun to cause the apparent variability in the climate here on earth. This is clearly true as there is less than a 1% variability in the output of the sun over the course of a cycle, which would support about a 0.2K degree variance from top to bottom or 0.1K from centerline, which would be nearly undetectable, despite the habit of the AGW crowd of reporting temperatures to 2-3 decimal places. However, that does not necessarily rule out that some other mechanism that is in some way dependent on the sun is responsible. The Earth’s atmosphere is a very complex and chaotic system. Skepticism of any simplistic hypothesis that claims to explain it is just reasonable prudence. The way to counter skepticism is to make predictions and await the results. Thanks for your support, but make the cycle variability about ten times smaller, more like 0.1% [agreed that less than 1% covers 0.1%, but so does less than 95% 🙂 ]. And, there is a difference between ‘not ruled out’ and ‘satisfactorily demonstrated’. Leif, in sheer number of dust ups, particularly with experts, I am not remotely your peer. Leif will correct the 1% to .1%, but it is not clearly “true” that solar energy over the course of a cycle indicates that there is not enough variability for the sun to significantly affect the climate. A variability of 0.1% represents as much forcing as claimed by AGW for CO2, equivalent to about .13% of total solar irradiance. 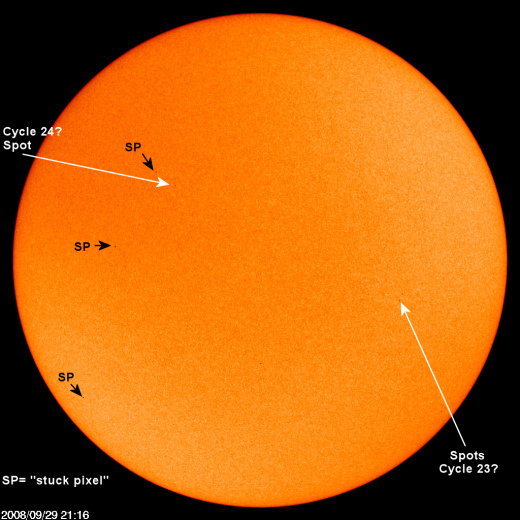 Cycle to cycle, of course, does not vary by that when smoothed, but over a longer period cycles are seen to increase and decrease in sunspot activity, which is seen to roughly correspond to solar energy affecting the climate. And the prevailing understanding is that there is a strong correlation between these changes and temperature. Leif’s position is similar to your own understanding of the AGW crowd reporting temp to 2-3 decimal points, but from hundreds of years in the past. Leif will correct the 1% to .1%, but it is not clearly “true” that solar energy over the course of a cycle indicates that there is not enough variability for the sun to significantly affect the climate. […] Cycle to cycle, of course, does not vary by that when smoothed, but over a longer period cycles are seen to increase and decrease in sunspot activity. But since they always return to the same minimum value [~zero] the variation stays within what we have seen during the last 100 years so has no long-term trend. And the prevailing understanding is that there is a strong correlation between these changes and temperature. There is no such understanding, as that would limit climate changes to what have been observed the last century or so. Oops, misplaced a decimal point. Thanks for the correction. Leif, I’ve provided you with numerous references that support the fact of an accepted correlation between solar energy and temperature, that the IPCC attributes a part of the increase of the first half of the 20th century to solar irradiation increase, and on and on. We *have* seen a long term trend. “Results from Active Cavity Radiometer Irradiance Monitor (ACRIM) experiments show an upward trend in total solar irradiance of 0.036 percent per decade between the minima of solar cycles 21 and 22. Please do not pollute this blog with references to obsolete papers. Willson’s claim of an increase of TSI between the minima of cycle 21 and 22 has long been debunked as a calibration problem of the ACRIM data. How is the 0.1% change in variability in the cycles measured? Surely not spots? Also, isn’t the difference between the weakest strongest cycles more than 50%? Measurement of the total amount of heat and light from the Sun, the Total Solar Irradiance, TSI, in Watt per square meter. Yes, from 0.05% to 0.1%. Over which wavelengths (or frequency) is the TSI measured? Using what kind of sensor? you agree that every occurrence of Neptune/Uranus coming together in the last 700 years DID correlate with a solar minimum as per Dalton, Maunder,Sporer, Wolf? On my way to work this morning, I came up with a pure conjecture about a possible mechanism that could link the activity of the Sun to climate variability on the Earth, without using irradiance. As the solar winds subside, the oblong shape of the earths magnetic field becomes more spherical since there is left deflection. The center of the long tail is always on the side of Earth facing directly away from the Sun and is therefore the night side. At night, the Earth loses a net energy to space, which lowers the night temperatures and accounts for the low end of the temperature average. My conjecture is that perhaps the magnetic field distorts the atmosphere, if even only some trace gasses, so that a greenhouse effect could be extended to a greater extent into space around Earth, nighttime cooling could be slowed to some degree. It would not have to be the bulk of the atmosphere, just some ionized gas, or even just a “small puff of air”. When the magnetosphere is more spherical, perhaps the night side can then give up more energy, leading to cooler times. If this is possible, it could have a much greater effect on the temperatures of earth than the variability of solar irradiance would imply. Sadly, I have not found any links on the web supporting or dismissing this idea. No, you can make no such assumption. You might have noticed that once the discussion strays too far away from science I stop paying attention. Like one of your statements: “we don’t know how gravity influences a plasma”. Yes we do know. 99.99[…]99% of the Universe [including the Sun] is a plasma and we know very well how gravity works with that. And ‘sadly’ you won’t. The Earth’s magnetosphere and atmosphere do not interact anywhere close to what you describe. For one, the night side ‘tail’ is VERY long, like 10 times the distance to the Moon. I think that you misunderstand me. You are apparently assuming that I mean the entire downstream portion of the magentosphere. There is no reason that every cubic inch of it would have to contribute, just a portion that interacts with the atmosphere, that is also influenced by the sun. For example in this article, the US Geological Survey talks about the interaction of the magentic field with the ionosphere. I am not sure if the deflection of the magnetic field is significant at that altitude, but if it is, the ionosphere will be effected in some way. We all know that the ionosphere changes when the sun is active to allow for radio enthusists to have more success at long distance communication. Perhaps it is not shape, but composition. I.e., in a less active solar environment the radiation that is bounced is biased more toward the infrared bands. I am not claiming that any of this is happening, but I am wondering if it is possible? It takes place 40,000 miles up. There are effects associated with the changing size of the magnetosphere, for instance, the tendency of geomagnetic activity [and aurorae and satellite drag, etc] to be larger near the equinoxes is likely due to the magnetosphere being slightly smaller a these times, but it is unlikely that that has anything to do with the radiation budget in the lower atmosphere. Although you can find people that will claim that [and weirder things]. Thanks for taking the time to answer my questions. I guess I will stop searching for a suit to wear to the ceremonies awarding the Nobel Prize in Physics. … every occurrence of Neptune/Uranus coming together in the last 700 years DID correlate with a solar minimum as per Dalton, Maunder,Sporer, Wolf? Just for fun I tested this statement in a simulator. It somehow “works” for conjunctions in 1308, 1479, 1650 and 1821, but fails for 1993. Debunked, absolutely. Note the two weasel words: “if” and “might have”. Especially their Figure 4. No variation of TSI from minimum to minimum. Note, how the earlier reconstructions, that showed such variations, have steadily converged to flat-lining. As I have said before, hunting around on the Internet for snippets that match your opinion is no substitute for actually knowing what is being done [as well as being an activity participant] in the field. “The Earth’s weather and climate regime is determined by the total solar irradiance (TSI) and its interactions with the Earth’s atmosphere, oceans and landmasses. Of course, turn off the Sun and all that…But says nothing about the variations. Evidence from both 29 years of direct satellite monitoring and historical proxy data leaves no doubt that solar luminosity in general, and TSI in particular, are intrinsically variable phenomena. Also true, but says nothing about the size of the variability, which is the crux of the matter. Subtle variations of TSI resulting from periodic changes in the Earth’s orbit (Milankovich cycles: ~20, 40 and 100 Kyrs) cause climate change ranging from major ice ages to the present inter-glacial, clearly demonstrating the dominance of TSI in climate change on long timescales. TSI monitoring, cosmogenic isotope analyses and correlative climate data indicate that variations of the TSI have been a significant climate forcing during the current inter-glacial period (the last ~ 10 Kyrs.). are dealing with changes not of the Sun, but of the aspect of the Earth over ten of thousands of years. Phenomenological analyses of TSI monitoring results during the past (nearly) three decades, TSI proxies during the past 400 years and the records of surface temperature show that TSI variation has been the dominant forcing for climate change during the industrial era. Is the only reference to our debate and that only over the industrial era. The TSI record only shows three solar cycles of ~11 years each and 11-year cycles are not the 30-year intervals that define climate, so a bit a sleight of hand here. Could even be true, but says nothing about the tiny size of this variation. contains the weasel words if and might have and is therefore a far cry from ‘prevailing understanding’ and ‘accepted’. shows [as is proper] that there is no change from minimum to minimum, and, in particular, not the calibration error in the ACRIM data between cycle 21 and 22. At the recent SORCE 2008 meeting Judith Lean concluded that for TSI “longer-term variations not yet detectable-… do they occur?”. You can see more of the modern view of TSI reconstructions here: http://www.astro.phys.ethz.ch/papers/haberreiter/Schoell_subm2007.pdf Especially their Figure 4, that shows how at each minimum TSI returns to the same value. Note also how the older [now obsoleted] TSI reconstructions converge with time to the flat-lining that I have pointed out repeatedly. Hunting around on the Internet for snippets that out of context may support your opinion is no substitute for deep knowledge of [and active participation in] the field. You would be better informed by accepting this and move forward with a solid basic understanding that can be had here ‘chez’ Anthony. “… every occurrence of Neptune/Uranus coming together in the last 700 years DID correlate with a solar minimum as per Dalton, Maunder,Sporer, Wolf? And what does your Simulator say for 2009? I appreciate your efforts Leif, and I learn more from you than from _any_ other source on this subject. How certain are we that the temperature of our planet returns to a level that reflects the TSI minimum in the solar cycle? I have read that it takes hundreds of years for the oceans heatsink-effect to catch up with variation in atmospheric temperature. Surely the same would be for variation in TSI? Did the earths temperature (climate) during the maunder minimum better reflect the TSI of solar minimum? Are these related to your questions on CA about the climate having a higher sensitivity to TSI than “we” think? anyone else notice 1, maybe 2 new sunspecks today? Can’t see the specks yet but I definitely see a plage and a pronounced BMR (bi-polar magnetic region) fairly deep in the southern hemisphere, just coming out of the eastern limb. A couple small areas nearer the central meridian, south of 30 degrees S also look like they have specklet potential. This is definitely SC24 activity, but as often happens when the specks are small, Joy’s law is not well obeyed. The leading polarity seems to be ‘black’ which is what it was for SC23 southern Hemisphere spots. Does anyone know what the alignment of Neptune, Uranus, and Jupiter does to the Barycenter of the Solar System and its possible contribution to a quieter Sun? I find the relationship intriguing. Thanks.